This model has been discontinued. 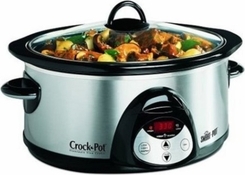 As an alternative, we recommend the Rival SCVC604 6 Quart Slow Cooker. This outstanding kitchen appliance makes cooking easy! Just set the time and temperature and then walk away. Your slow cooker will do the rest. Automatically shifts to a warm setting when the programmed cooking time is complete, so you can hold dinner until needed.